Baking And Boys! : MY FIRST LOVE! So I just watched an episode of Oprah that I'd recorded a few days ago and she had none other than my guy, Rick Springfield, on. And you all thought Clay Aiken was my man. Rick was my first love and he's still just as much a GREAT singer and performer as he ever was! He had that audience jumping. So I'll always love this guy. 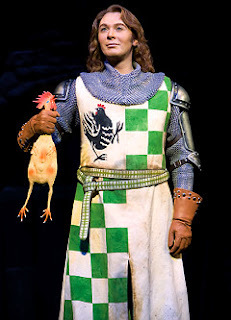 Now for Clay, have ya'll heard that I'm making my first trip to NYC in April--to go see Clay on Broadway in Spamalot. Can't wait! It will be so FUN. Going with my sister-in-law, Monica, and Kevin's sister, Kristy, who also loves Clay but has never been able to see him in concert or anything. We are going to have so much fun. We're also going to see Wicked and tear up that town in the short time we'll be there. April 24 cannot come fast enough! lucky you! you will love nyc! have a great time with your clay and your real-life man!